The new Public Procurement Directives pave the way for the digitalisation of public procurement. Their impact goes beyond the simple uptake of electronic tools with digitalisation simplifying the entire procurement cycle for businesses and public buyers. Beyond reducing administrative burden, this simplification will also result in higher traceability of procurement procedures. Overall, the use of digital tools will contribute to greater transparency in public spending, improved access to market opportunities and better value for money. The European Single Procurement Document (ESPD) is a self-declaration form replacing the various different forms used in the past by EU Members States for proving that a bidder fulfils the exclusion and selection criteria (e.g. they have paid taxes and have sufficient financial standing). Evidence will only have to be provided by the tender winners. However, even this obligation could be removed in the future once e-procurement solutions are linked to repositories of actual evidence (see 3. below). The ESPD would then act as a ’business passport‘ for companies bidding for tenders anywhere in the EU. While a paper form of the ESPD exists, it is meant to be used exclusively electronically. There are two possibilities to generate an e-ESPD. First, the Commission has developed a free online service. Second, a structured data exchange model is available for public buyers, providers of e-procurement solutions or any other party interested in integrating it into their solutions. Today´s simplification of the tender procedures via the introduction of the ESPD is one of the major elements of public procurement reform, which will enter into force on 18 April 2016. The ESPD online service is also integrated with e-Certis, a mapping tool that helps participants of public procurement procedures identify and compare different certificates requested in procurement procedures across the EU. This is essential for any European company wishing to participate in a public procurement procedure (also at national level, where all relevant information is available in a one-stop-shop) or a public buyer that has to evaluate bids received from various EU countries. E-Certis helps them understand the documents used for proving the fulfilment of the exclusion or selection criteria, such as the criminal record and good financial standing. The Commission supports Member States in their transition to end-to-end e-procurement by co-funding the integration of ESPD and e-Certis into existing solutions, facilitating the exchange of best practice, and providing tailor-made training sessions and assistance in the design of national e-procurement strategies. The revised public procurement framework also facilitates the introduction of modern and simple procurement techniques, such as the use of e-catalogues (similar to private e-shops), e-auctions and dynamic purchasing systems. The long term vision of European public procurement reform aims at creating an e-procurement ecosystem, which facilitates the seamless interaction of businesses with public buyers. The ‘once-only’ principle is one of the main guiding ideas of the reform. It, suggests that each document will be provided to the public authorities only once so that they can check eligibility. This lets companies devote the time saved on providing documents to their core business. The challenges include simulating the user-friendliness of private or public e-commerce platforms while also respecting the rules of public procurement legislation, as well as following the requirement of maximum transparency and open access to business opportunities for business of all sizes and from all Member States. 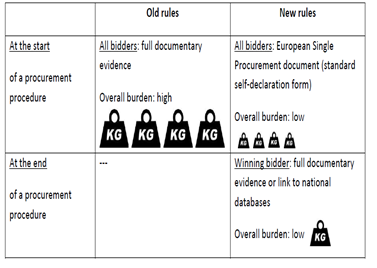 The above changes put e-procurement at the heart of the public procurement reform brought about by the new directives for the sake of public buyers, businesses and taxpayers.